Find out how to improve your mental focus and add some clarity to your thinking with these sweet herbal treats. 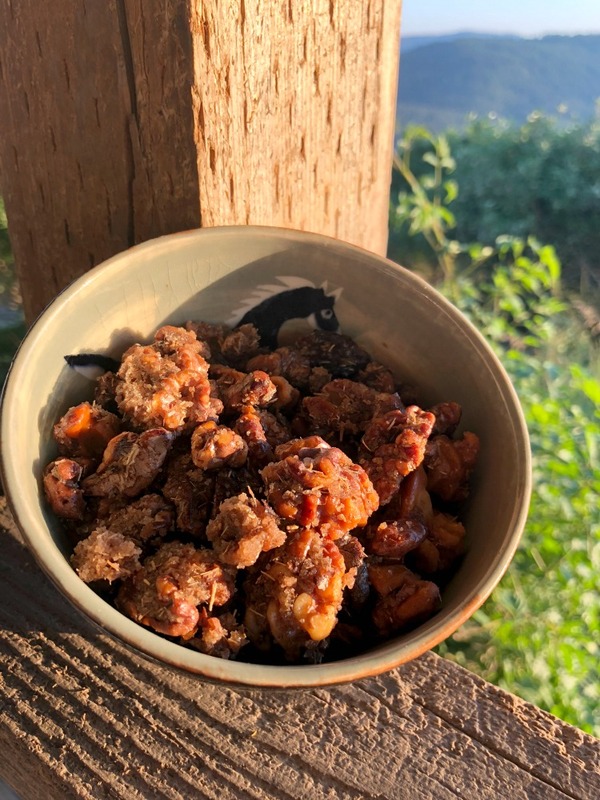 These candied walnuts with eleuthero are perfect for gifting at the holidays, a Fall spicy treat, or to enjoy any time you want a mental pick-me-up! And now I am officially addicted! I'm so excited! Adams Media publishing company sent me a copy of Agatha Noveille's new book, The Complete Guide to Adaptogens to review. I've been a fan of Agatha's for quite some time. She runs the website, Indie Herbalist, writes for The Herbal Academy of New England, and really knows her stuff. I thought I'd share one of the recipes from her book with you today (and it was hard to choose one, there are so many good ones)! 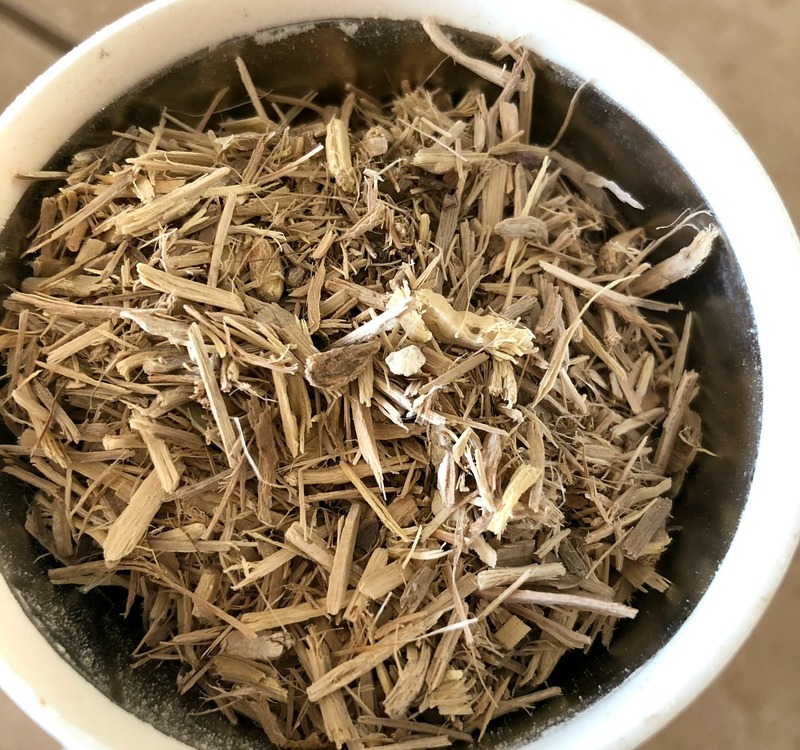 But first, let's talk about Adaptogenic herbs for a moment. Let me just say: You need adaptogens in your life. You're probably wondering what they are? And why you need them? In a nutshell, adaptogens help your body react and balance itself to all kinds of different stressors. They help the body to adjust to stresses from the typical day-to-day work stress, the stress athletes' bodies endure from physical stressors, stress from illness, emotional trauma, etc. They are truly the best form of general health-supporting herbs around and are safe to take every day. They also help the body function optimally in a variety of areas. Agatha has a great history of adaptogens included in her book that was just fascinating to read. It "produces...an increase in the power of resistance against multiple stressors, including physical, chemical, or biological agents." 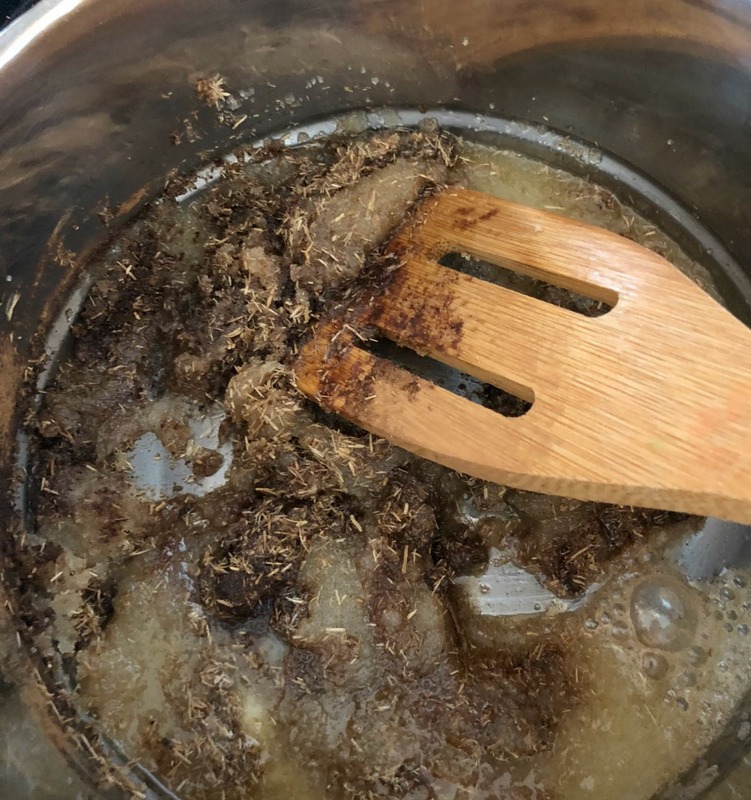 Agatha's entire book is about different adaptogens, how to use them correctly, and recipes to easily fit them into your daily life for support in different areas of need. These are some special herbs that are safe to use and can play an important part in our health! Now---What you've been waiting for! The recipe for Candied Walnuts with Eleuthero---and my GOSH, these ARE. SO. GOOD! I am addicted! Note: I doubled the recipe in the book because I knew I would love these. I'm so glad I did! Also, the labels "organic" and "grass-fed" are my own because I feel strongly we should be eating foods without pesticides and non-GMO and non-CAFO if we can. Just saying. Here's my Eleuthero root in the spice grinder. Ideally, you would use Eleuthero Powder, but I didn't have any on hand. I ground the root as finely as I could, and I was still delicious! I get my herbs from Starwest Botanicals, but the link above is for Amazon. Step 1) Toast the walnuts on a baking sheet in a 350 degree oven for about 10 minutes, more or less. You can adjust to your level of toastiness. This will give your walnuts a wonderful toasted crisp flavor. If you don't want to toast them, though, you can just skip this part. Step 3) Place the butter, sugar, and spices into a small sauce pan. Stir continuously until the butter has melted and everything is mixed together well. Step 4) Now quickly stir the toasted (or not) walnuts into the mixture. Stir gently so as not to break the walnuts and continuously until they are all coated with the sugar mixture. YUM! Step 5) Spread the coated walnuts onto the parchment paper lined sheet. Try to separate them from each other if you can so they don't stick together. Let them cool completely. Step 6) Store them in an airtight container---I just used a pint sized Mason jar, since I doubled the recipe. Step 7) ENJOY! Mr. V. and I ate at least half of these the very first night. Oh. My. Gosh! Delicious! There are so many recipes in this book, it was truly difficult to decide which one to try first! 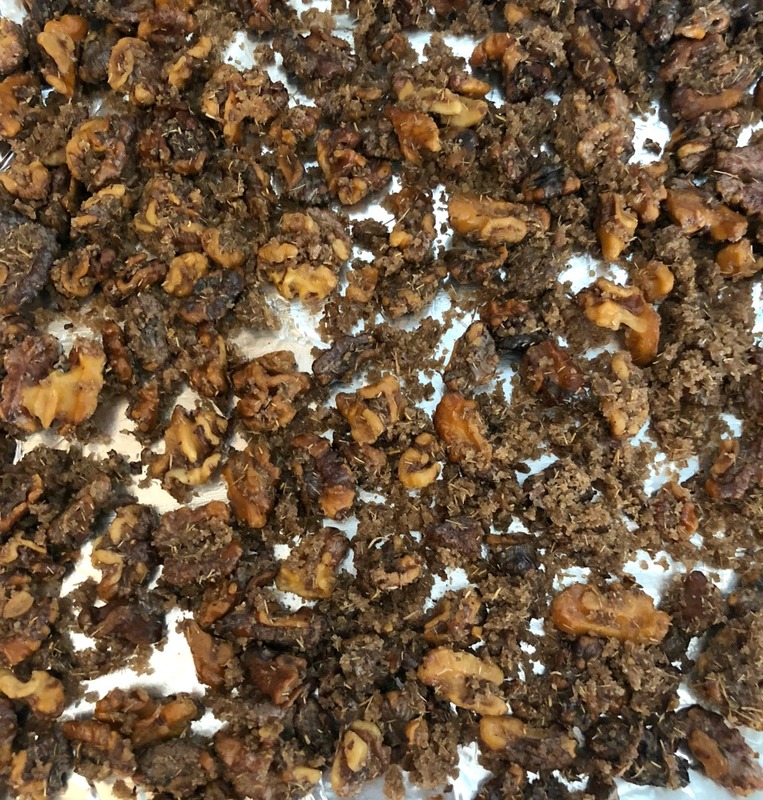 How Do the Spices in This Candied Walnut With Eleuthero Recipe Help You? "Equally suited for men and women and especially beneficial for the elderly, eleuthero is gentle, suppportive, and good for long-term use. It has nervine actions and offers cognitive support, aids the health of the immune system, and can support healthy cholesterol levels and heart health during stressful times." Eleuthero is also great for athletes, as it supports endurance and shortens recovery times. If you work in a very stressful job, have long or atypical hours, or have trouble sleeping, eleuthero may just help you out! Yep! Walnuts, the main ingredient, are also terrific for your brain and body. They have high levels of DHA, which is an important omega fatty acid. This type of fatty acid helps the neurons in your brain function better. Super brain food, my friend. Perfect for after dinner, too! I love this book! I feel so blessed to have been able to review it and share my opinion. The Complete Guide to Adaptogens is a welcome addition to my personal herbal library. If you are trying to improve your health with herbs, using adaptogens is a great way to start. This book will help give you a great overall background in herbs that are excellent adaptogens, tons of great recipes that are easy to use, and information and ideas you can easily integrate into your daily life for ultimate health. As I said earlier, I have been a fan of Agatha (The Indie Herbalist) for quite some time. She is a clinical herbalist, and I have learned a lot from her writings over the years. I highly recommend her book whether you are new to using herbs or are a seasoned professional. The Complete Guide to Adaptogens would also make a great gift for a budding or experienced herbalist due to the information as well as the pure loveliness of it. There are 75+ recipes for tonics, teas, extracts, elixirs, and more (like this wonderful healthy treat I just shared!). ***And if you are interested in taking a course in herbalism, The Herbal Academy of New England has all kinds of courses, from beginner to advanced, along with specialty courses too! As far as this particular recipe goes---I will be making these candied walnuts often. When I said I'm addicted, I'm not even kidding. I am wondering if you could use raw honey? Hmmmm? This is something I'll be researching and trying. Besides just gorging on these (my choice), you can add them to yogurt, granola, trail mix, and oatmeal! What is your favorite sweet treat that is healthy? And if you've made candied walnuts before, do you know if it's ok to use honey? Leave comments in the comments section! How to Make Fire Cider: An Herbal Tonic to Start Right Now! Ten Herbal Teas That Only Use TWO Herbs---Drink Tea for Health!